...finished my layout entry for Treasured Hunt round 1. ...made baked beans and pulled out my super delicious pickles to go with grilled weiners. great day though. Doug and the babes cleaned the house. I played pac-man and scrapped. Here was the challenge requirements for round 1 @ Treasured. Are you ladies ready for your first challenge? Here it is...it's relatively simple so I want to see your creative juices flowing and see what you come up with! BE CREATIVE!! - journaling....and the journaling must begin with "Today I..."
It can be as long or as short as you like but must begin with those words. Now all I do is sit and wait until Tuesday to see if I make it to the next round... crossing my fingers here.. the gallery is brilliant with all the round one entries. Hope everyone had a wonderful day! 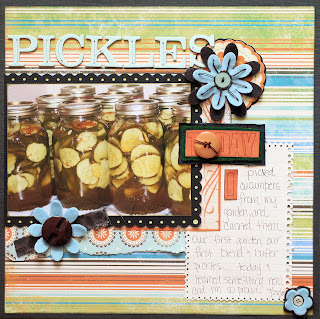 Seriously love pickles... this layout is so awesome!!! I am rooting for ya! Those pickles look delicious. Great take on the challenge! !